Kids and grown-ups alike just love to see things grow. If you ever watched, fascinated, as your childhood sea monkeys went through their short jig of a lifespan, you know what I mean. If you feel compelled to put seeds in soil every spring, or even if you enjoy seeing a whole bunch of new messages expanding your email inbox, youâ€™ve experienced the grown-up version. Sadly, right now, everything seems stagnant. Itâ€™s consistently cold and icy outside, with just slight variations between you-may-or-may-not-need-a-hat cold and youâ€™ll-die-without-a-ski mask cold. Just a few miles from me as I write this, Congress looked at a resolution that would have nudged the situation in Iraq with the force of a feather and declared it was too much. Best not to upset the status quo. I also swear that my email traffic has gone down, perhaps giving in to the phenomenon of things getting slower in colder temperatures. And in these temperatures, if seems like nothing edible or green is growing to change the landscape or our local food choices. I guess itâ€™s no wonder that I crave movement, evolution, seeing new life poke out of the heavy skin of the everyday. But wait â€“ I lied. Growth is happening now, and whatâ€™s even better is that we can orchestrate some growth of our own. Sap is moving in the trees, which the Jewish holiday of Tu Bâ€™Shevat just reminded us. On this holiday, whose subtitle is â€œthe new year of trees,â€ Jewish folks traditionally eat a new fruit that they havenâ€™t had in a while. Traditions that make you eat are always cool in my book. This one was especially welcome. Then thereâ€™s greens. Greens like kale love the cold and continue to grow through the winter. They taste even better after theyâ€™ve survived a few frosts and sat under some snow. Local farms may be shipping them to your grocery store right now. What you personally want to do for a change is up to you. My humble suggestion? Sprouts. They give you that childhood amusement of watching things change before your eyes and that grown-up thrill with things growing, regardless of the season. 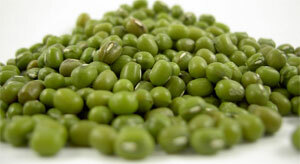 Mung beans are small, green legumes used most often in Indian cooking. The great thing about these is theyâ€™ll pop out of their skin in just 24 hours. This is great for people like me who donâ€™t have the patience to constantly rinse and stroke and whisper to dainty little alfalfa seeds, with the whole process taking 3 or 4 days. And unlike light, delicate alfalfa sprouts, mung bean sprouts make a hearty, crunchy, winter-worthy ingredient. 2 cups whole mung beans (you can adjust this amount â€“ the method will be the same, using 1 part mung beans to 3.5 parts water for soaking). Soak the beans in the water for 12 hours at room temperature. Drain. Line a bowl with a wet dish towel thatâ€™s about twice the size of the bowl so that some of the towel is left hanging off the side. Note on the towel: When I made these sprouts, the beans stained the towel a bright yellow in some spots. So use a towel that you donâ€™t care much about, or opt for a few layers of cheese cloth (unbleached is best, of course!) so you can throw it away after. Cover the beans with the hanging part of the towel, then cover with a pot lid that will not press on the beans. You can probably use plastic wrap if you donâ€™t have the right size lid. Leave in a dark place like an oven for 12 hours. Now uncover your beans and voilaâ€”you will see little white tails bursting out of the green skin. Tastes good and good for you! Might be just the kind of change and growth you need to get going. What we need is more Global Warming because then we can plant all sorts of things that will live through the winters… because winters will be a time of tanning and body surfing (summers, by contrast, will be a time of living in giant caves carved in the earth because everything on the surface will be a giant bonfire!). Food challenge for you: how do I make a 100% super-healthy pizza that a) won’t make my heart explode, and b) doesn’t taste like day-old produce swept off the sidewalks by large sweaty men in mud-caked workboots? Indeed, daily I must fight the urge to buy a Hummer stretch limo and drive around and around the beltway, hoping to emit enough CO2 to eliminate winter forever. But we must let ourselves be inspired by the seasons. Necessity is the mother of invention. In food terms, this translates into freezing, depressing weather bringing about great recipes for soup and blog posts about bean sprouts. As for the pizza, hereâ€™s what I think: start with a good focaccia bread–you know, the kind glistening with olive oil? Olive oilâ€™s good, non-heart-exploding fat, unlike the stuff found in layers of extra cheese at a pizza joint. You can also build your pizza on tortillas, which are low fat and perfect for lovers of thin crust. If you’re using flour ones, toast them beforehand so they’ll toughen up and not dissolve under your sauce. Now spread your focaccia or tortilla with tomato sauce or pesto. At this point, you can add shredded mozzarella if you want some ooey gooey cheese, or sprinkle on grated parmesan. But Iâ€™d argue you donâ€™t need any cheese at all. Top it with fresh tomatoes sliced nice and thin, sun dried tomatoes plumped in a little hot water, olives, fresh or dried herbs, artichoke hearts, sliced mushrooms, etc. Now drizzle with extra virgin olive oil and bake or broil until the toppings get crispy. Papa John, eat your heart out! Trick to a healthy pizza — make it at home. That way you can use fresh ingredients (like good quality part skim mozz, instead of the fattening mix most pizza places use) and make your own crust. Most pizza places add shortening or other kinds of fat to their crusts to increase the flavor. Give it a whirl. Hit me up if you need any recipes, I’ve got a bunch. Mmm, I like the idea of not having to wait for those pesky alfalfa sprouts to grow, watering them and draining them twice day and making sure they have the right amount of warmth, light, etc. I’m definitely going to give the mung beans a try!